Expanding the reef is part of a $5 million state program to improve underwater habitats and boost sport fishing, diving industries. 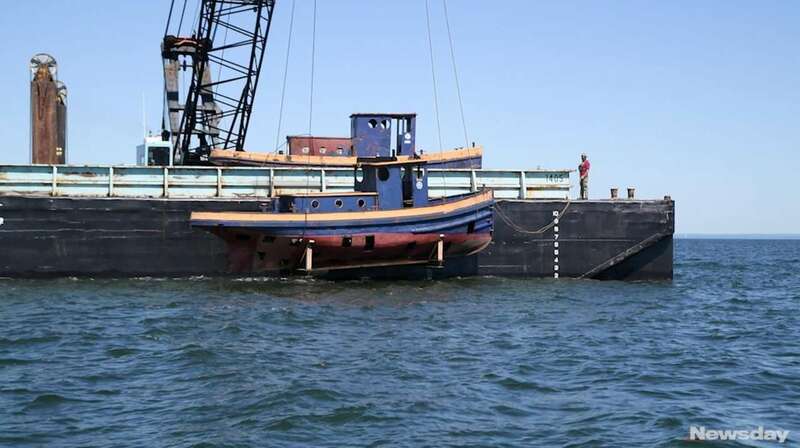 The Smithtown Reef, one of two artificial reefs in Long Island Sound, grew broader and taller Thursday with the addition of 75 tons of steel pipe and two scuttled vessels. Within hours, New York State environmental officials said, sea bass, blackfish and summer flounder would explore the new places to hide and hunt. Encrusting organisms should follow in coming months, growing thick on the steel. Gov. Andrew M. Cuomo ordered the expansion of a dozen artificial reefs off Long Island that date to the 1980s to improve marine habitats, promote biodiversity and boost sport fishing and diving industries. The work will be the largest expansion of artificial reefs in the state's history. The first six expansions are expected to be completed this year at a cost of $5 million, officials said. For reef material, workers are using a fleet of decommissioned and cleaned tugboats, barges and scows, concrete and steel and recyclables from the Tappan Zee Bridge. Smithtown Reef, totaling 3 acres about a mile and a half off the mouth of Stony Brook Harbor, was the second to be expanded. The first, in June, was a reef near the Shinnecock Inlet, on the South Shore. Larger reefs on the South Shore top 100 acres. The Witte 1405 barge holding the material was already in place when an observatory vessel bobbed close with Lt. Gov. Kathy Hochul, DEC Commissioner Basil Seggos, Suffolk County Legislator Rob Trotta (R-Fort Salonga) and Smithtown Supervisor Edward Wehrheim on Thursday morning. Seawater sloshed over the dignitaries’ shoes. Nobody seemed to mind. Wehrheim said he remembered his father pulling 35-pound bass out of the water when he was a boy and he hoped that bigger reefs might “bring that type of fishing back to the Long Island Sound” and boost interest in local waterways. Twenty-foot pipe dropped thunderously by crane, sinking 40 feet to the Sound floor of mostly bare sand, creating there what Seggos called a “Pick-up sticks” mound. Then came two 40-foot vessels, painted red, yellow and blue. They lacked engines and squares had been cut into their hulls to make them sink. What remained was good thick steel; anything thinner, like a car chassis, would simply disintegrate in the salt water, Seggos said. They were ship's tenders that once belonged to the New York State Canal Corp. and guided vessels along the Erie Canal. They dated to 1928 and 1925, but had been dry-docked for more than a decade, Seggos said. The crane laid them down gently, one at a time. They lingered on the surface, then the Sound sucked them down.